You have no idea how much my heart aches from missing you. My life has a void that I know will never be filled. You’re gone. My life is incomplete. I will never be the same. It’s been three years since I’ve gotten one of your sloppy, juicy kisses. One of your hugs. Heard you sing a Beyonce song (I know we would have danced to 7/11).Three years since I’ve seen you dance to anything that had a beat. I haven’t been kicked in the face by you when you came and got in bed with me around this time of night. Three years since I’ve went to Popeyes and bought you a two piece dinner with the Cajun fries. I miss hearing you say, “Mama..” and “Bannon”. Three years since I’ve had to make you stop being mean to my other baby Brandon. Life is definitely not the same. Everyday, Brandon and I bring up your name in conversation. You’re never far away from our thoughts. Our future….what is that? It’s hard to plan since you’re not here. I feel guilty about doing new things because I can’t experience them with you. Everything is so bittersweet. I wonder what you would be like now. You’d be 5 years old. Going to the first grade. 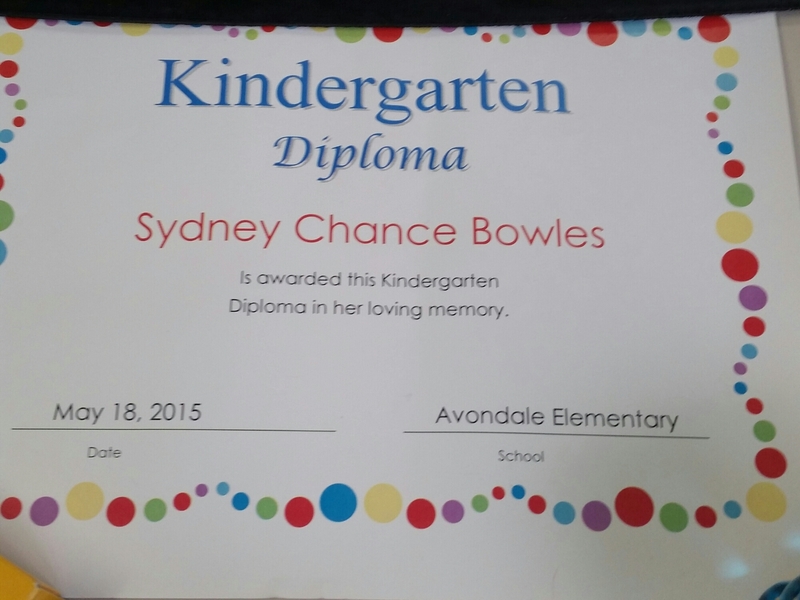 Did you know that you have your own kindergarten diploma? I miss you everyday. Through your leaving me, I’ve learned my purpose. I’m carrying on your legacy baby girl. I’m “helping the babies” like you’re doing. I’m helping their mothers. I’m fighting for you while missing you. These tears I’m crying are not all tears of sadness. I’m proud to be your Mom. I’ll see you again. We’ll be together again. I’m sure Shen is tired of Chance lol.